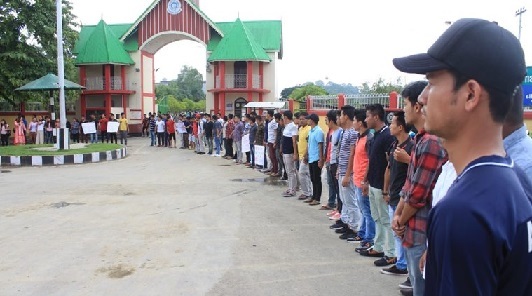 The Manipur government on Thursday rejected the request of Manipur University (MU) Vice Chancellor to provide additional security in order to resume normal function of the university under security cover. Manipur University Vice Chancellor, Adya Prasad Pandey, it is learnt, had requested State Chief Minister N Biren Singh for additional state force apart from CRPF personnel escorting him. However, according to State Home Department sources, the Chief Minister had turned down his request keeping in view the sanctity of the campus besides considering the sensitivity of prevailing situation. 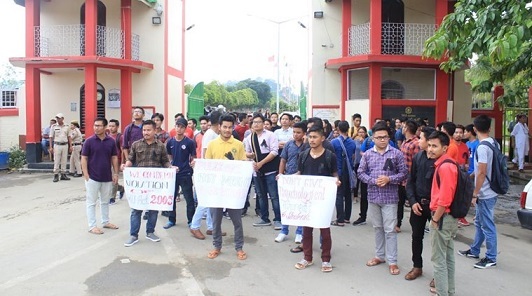 Meanwhile, the agitating Manipur University Students Union (MUSU) has cautioned to intensify its protest on June 24 if the authority fails to replace the Vice Chancellor. The MUSU activists on Thursday formed a human chain in front of the main gate of the university demanding immediate removal of the present Vice Chancellor. Meanwhile, the on-going entered its 24th day on Friday with absolutely no activity in the university all these days. The agitating students of the university had sent separate memoranda to the President Ram Nath Kovind, Prime Minister Narendra Modi, Union Human Resources Minister Prakash Javadekar, State Chief Minister Biren Singh and Governor Dr Najma Heptulla. 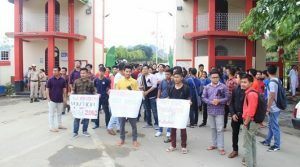 Notably, the agitation of the students has garnered patronage from the university teachers with the Manipur University Teachers Association extending their support to the agitation. The teachers’ body has also demanded proper inquiry into alleged financial irregularities by the Vice Chancellor. The university teachers further alleged that the Vice Chancellor was always out of station and touring places at the expense of the university. The teachers further said that the Vice Chancellor has made the university campus a virtual war zone explicit with security guards and himself moving in bullet-proof vehicles. It has also been alleged that the Vice Chancellor has been partying at his office as if it is a night club.